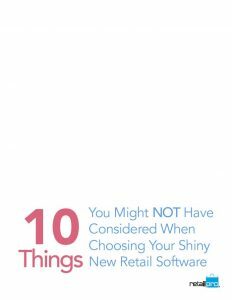 A Must-Read if You’re Considering a New Retail Management System! Is It Made For Your Industry? What are Your Current and Long-term Needs? How Strong Is Your Server? What Is The Deployment Time? Marrying Brick & Web: Ready To Commit? Download this whitepaper today and you’ll be more knowledgeable about selecting a retail management system, and how to approach the process to ensure you make the right choice for your retail business today and well into the future.